The Estonian Stock provider will be the first Use Case of the Copytrack Blockchain. Berlin / Singapore, 27 March 2018. Copytrack, the image rights portal, plan their first cooperation shortly after the successful Initial Coin Offering (ICO) for their blockchain based Global Copyright Register. As part of this cooperation, Photochain.io will be the first use case to untilize the service ran by the global market leader for handling online image rights. Both companies aim at creating a fair exchange between image providers and users worldwide. “The ambition of Photochain and Copytrack are heading in the same direction”, concludes Marcus Schmitt, Copytrack CEO. “We want to create a fair image market, where photographers can control their rights, and where image users aren’t in constant danger of stealing images.” Photochain will be the first partner to use the Copytrack blockchain for the registration of image rights and licenses. The blockchain of the Copytrack Global Copyright Register is open for use by other services in the digital content licensing field. The company also provides an API for its users to better incorporate them. Photochain.io will start its ICO in April 2018 and intend to generate 18 million Euros for the development of their platform. Photochain is a decentralized, completely new type of platform for stock photography. Based on the IPFS storage technology, the Estonian company wants to create fair conditions, low fees and maximum transparency for all participants in its offering. Similar to Copytrack, each image uploaded to the Photochain database is linked to a photographer or author. This link cannot be removed or manipulated in any way. The first version of Photochain is scheduled to go live in the first half of this year. Photochain successfully presented their project at the Leaders Blockchain Summit this March and came in third place. COPYTRACK – Global Copyright Control (www.COPYTRACK.com), headquartered in Berlin, currently employs around 25 people from the legal, IT, customer service and finance sectors. Furthermore, the company maintains a network of partners for legal enforcement. The service is aimed at photographers, publishers, picture agencies and e-commerce providers, among others. It includes a risk-free search of the worldwide Internet for image and graphic data uploaded by users at COPYTRACK with a hit accuracy of 98 percent. Customers define images used without a license and COPYTRACK takes full responsibility for an out-of-court solution in 140 countries as well as a court solution in the areas relevant to copyright. Only in the event of successful subsequent licensing will the rights holder receive up to 70 percent of the agreed sum. The pure search function is free of charge. 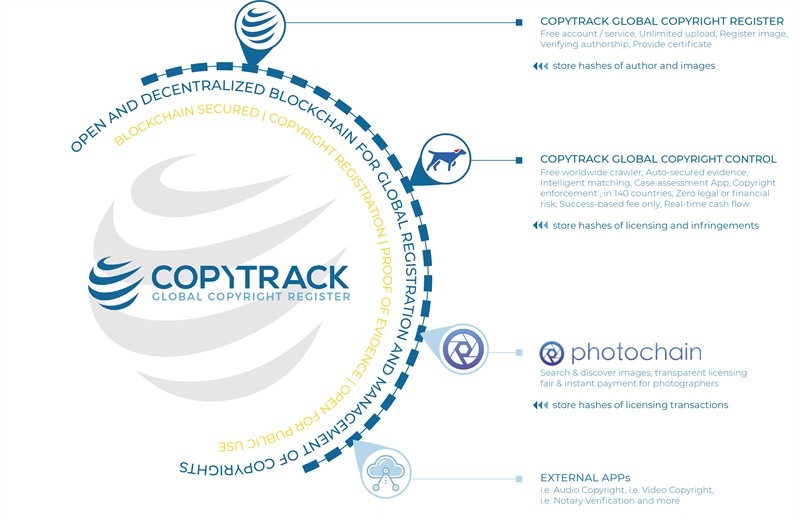 COPYTRACK – Global Copyright Register (http://www.copytrack.io) is based in Singapore and operates a blockchain-based register for the registration of rights to digital content. This register is free of charge for the rights holder and open for use by other services. Photochain - incorporated in Estonia, currently have 11 employees from the blockchain development, marketing, legal and business development sectors. They also have an additional 8 advisors for their ICO including individuals with significant security, tax and financial, photostock and decentralized software experience. Photochain’s ICO is advised by Swisscom Blockchain - the world renown Swiss blockchain incubator and Photochain are using Swisscom’s highly secure Launch Platform for their ICO. The platform is aimed at photographers, as they build a new way to buy and sell photography using blockchain technology. This allows photographers to set their own terms of sale, whilst receiving 95% of the proceeds of their works’ sales. Photochain’s simple on boarding process makes it easier for photographers of all levels to enter the photo stock industry. COPYTRACK (www.COPYTRACK.com) wurde 2015 von Marcus Schmitt gegründet und beschäftigt heute rund 25 Mitarbeiter aus den Bereich Legal, IT, Kundenservice und Finance. Der Service richtet sich u.a. an Fotografen, Verlage, Bildagenturen und e-commerce-Anbieter und umfasst eine risikofreie Durchsuchung des weltweiten Internets nach von den Nutzern bei COPYTRACK hochgeladenen Foto- und Grafikdaten mit einer Treffergenauigkeit von 98 Prozent. Die Kunden definieren ohne Lizenz genutzte Bilder und bestimmen selbst die Höhe nachträglicher Gebühren gestützt durch einen automatischen Lizenzrechner auf dem Portal. COPYTRACK übernimmt in voller Verantwortung eine außergerichtliche Lösung in 140 Ländern sowie eine gerichtliche Lösung in den urheberrechtlich relevanten Gebieten. Nur bei erfolgreicher Nachlizensierung erhält der Rechteinhaber bis zu 70 Prozent der vereinbarten Summe. Die reine Suchfunktion ist kostenfrei. The ambition of Photochain and Copytrack are heading in the same direction. We want to create a fair image market, where photographers can control their rights, and where image users aren't in constant danger of stealing images.